Our Science Sunday experiment this week, came straight out of The Jump Into Science with National Geographic book - Dirt by Steve "The Dirtmeister" Tomecek. 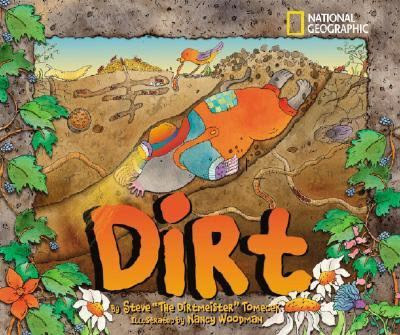 The book is a great introduction for younger to middle children, to the world of dirt - what it's made of, what it's good for, how it's formed, mapped, and studied. We decided to take a closer look ourselves. I poked small holes, with a thumbtack, in the bottoms of three plastic cups. And, the children filled the cups with sand, heavy clay dirt (from our garden, unfortunately), and potting soil. ...discovering that sand is the prettiest, looking like little jewels. The other two kinds of dirt looked pretty much the same, with small bits of rock, and roots, and brown stuff. Finally, we poured water into each cup. It went straight through the cup of sand, dripping out the bottom. But, it sat on top of the clay dirt, with almost no drips (the water underneath is from a spill while pouring, not from the cup). Some of the water dripped out of the bottom of the potting soil cup, but most of it was absorbed, and held by the dirt, obviously the best situation for plants trying to grow in the soil. If the water runs straight through, the plants need to be watered more often, and will dry out. But, if the water sits on top of the soil, it won't be able to get to the roots either. So, the best gardening soil has a mixture of sand, and clay. For more science themed fun, and projects for children, check out this week's Science Sunday link-up, over at Adventures in Mommydom. My kids would love this experiment - they enjoy nothing more than playing in the dirt! That is a great demonstration of the best soil for plants! We are the opposite of you and have such sandy soil. This looks like a lot of fun! If it ever stops raining, I think we'll try it out. Your clay is so dark! Our garden is mostly red clay. When we dig a hole to plant we dig deapper and wider than neccessary and then add potting soil to it to promote better growth. No worms in your dirt? :) That's a really neat experiment and the book looks great, too. We read that book last year and really liked it. This was a fun experiment. I'm sure they enjoyed it. Such a fun way to play in the dirt!